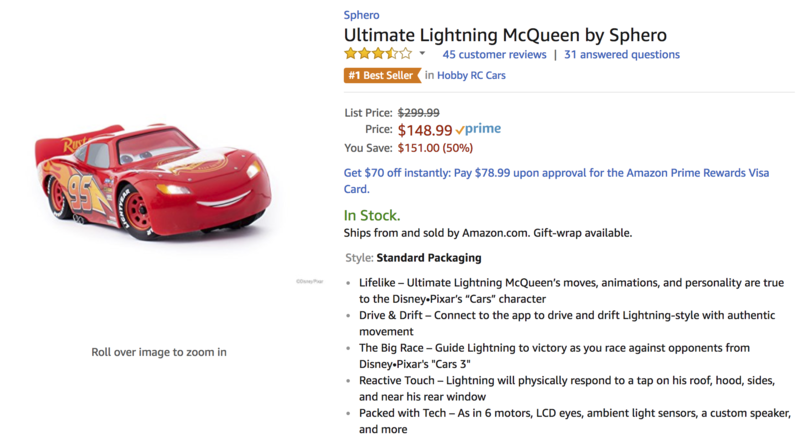 Ultimate Lightning McQueen is supposed to be a realistic scale version of the Cars movies' Lightning McQueen. There are a ton of motors, touch sensors, lights, and a speaker on board, all so that McQueen can talk and move just like the real thing. The actions are realistic, as are the catchphrases McQueen (or, more accurately, Owen Wilson) speaks. We experienced connectivity issues and were not fans of the unintuitive touch controls, but there are quite a few positive reviews on Amazon from very satisfied owners. The car's MSRP of $299.99 was obviously far too high, and the current price of $148.99 makes a lot more sense. Prime shipping is free. Hit the source link below to grab a talking and moving Lightning McQueen of your own.